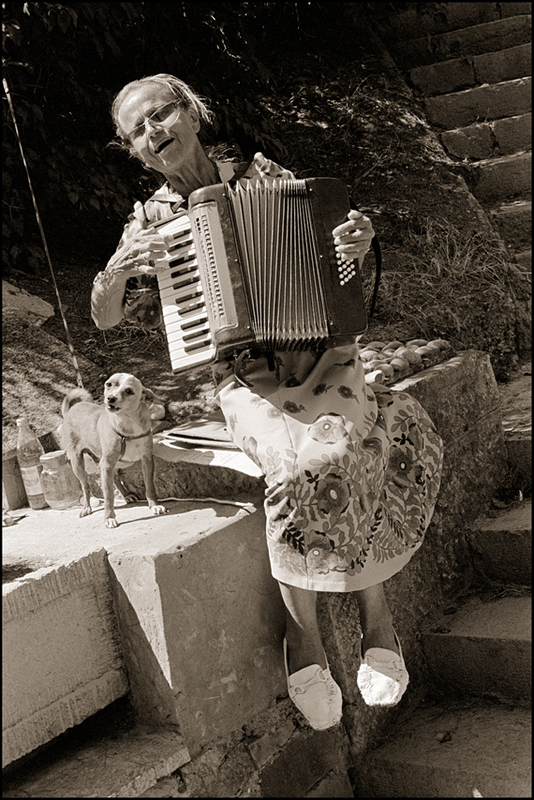 “A window on Ukraine” is a good title for these images by photographer Robert Burns. The pictures give far more than a snapshot, or a surface image, of their subjects. The viewer truly feels that she or he is looking undisturbed at an unfolding scene, offering insights before and beyond the moment when the shutter clicked. Elderly ladies, ragged children, artists and their studios, lovers embracing in front of a wall of handmade for-sale ads, a demonstration on Independence day, a choir of buxom ladies in national dress – a goodly slice of everyday life, from Kyiv, Lviv, Odessa, Piski and right up to the edge of the Chernobyl exclusion zone. The exception is that we see nothing of the gangsters, oligarchs and politicians who were robbing the country blind at the same time as these pictures were taken. They live in a different Ukraine altogether. Burns is a noted photographer and master printer who brought back to life and acclaim the work of 20th century photographer Margaret Watkins. Watkins was born in Canada, worked there and in New York, and from the 1930s lived in Glasgow until her death in 1969. It was sheer chance that took Burns to Ukraine for the first time in 2007. The year before, he met three Ukrainians whilst on holiday in Crete and accepted their invitation to visit them in Kyiv. When there he met many fellow artists, and amazing charity workers like Boas and Mirjam Adolphi who help the orphans sleeping rough on the streets of Kyiv. 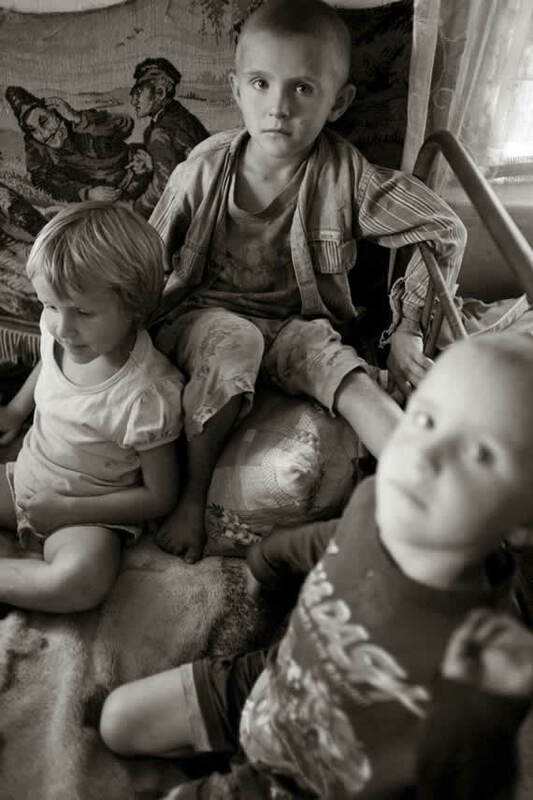 Burns visited and photographed children at the refuge they have established at Piski. He made a trip north to New Zalissyao, built for the inhabitants of old Zalissyao, now falling to ruin inside the exclusion zone around Chernobyl. In the show are photographs of inhabitants from the old city celebrating a harvest festival in the Russian Orthodox church in their new home town; it may just be projection, but there seems to be a deep sadness in their eyes. In 2011 he returned to Ukraine with Jim Gillies from Cumbernauld, who holds a vigil in George (Freedom) Square each year on 26th April to mark the terrible events of 1986 when the reactor exploded. 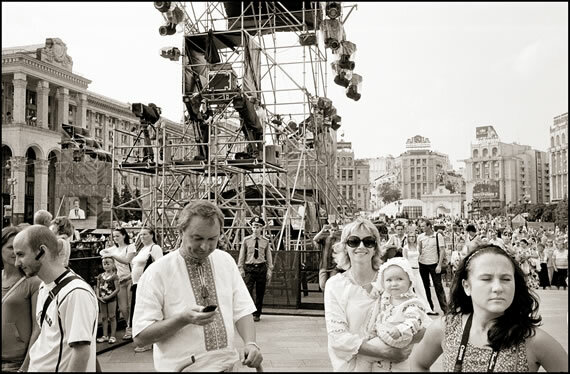 The proceeds from Jim Gillies’ book recording the visit, To Ukraine with Love, like those from the sale of catalogues from this show will be donated to the children’s charities and projects they encountered. Burns’ pictures have a timeless quality and not only because most are in black and white. These subjects could have existed, almost the same, in the 1930s, the 1970s or the 1990s, after the Soviet Union was dismantled and the economies of former member countries were in crisis. And that is definitely the spirit of these pictures. You can feel the life of the subjects pulsing through the frames, and they have a quality of empathy that you can’t fake. The exhibition continues until May 22nd at The Hidden Gallery, Glasgow and the gallery is open Tuesday to Saturday, 11am to 5pm. Entry is free but any sales of the catalogue or donations will go to Ukrainian children’s charities.